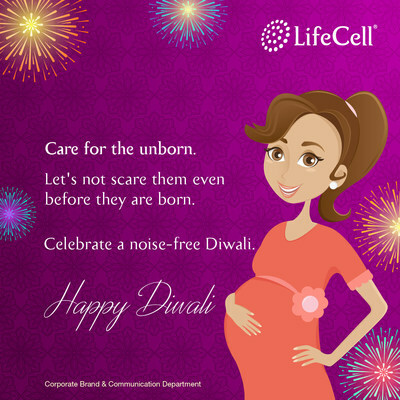 LifeCell India's premier stem cell bank, creates social messaging through an emotional appeal to restrict the use of fireworks during this Diwali to reduce noise and air pollution. At a time when the entire nation is witnessing the Supreme Court directions in restricting timings for fireworks, LifeCell on its part aims to give a new dimension for this as a social responsibility. The emotional messaging created by LifeCell is focused towards caring for the unborn baby and the pregnant women and urges people to restrict use of fireworks and avoid loud noise and air pollution to safeguard them. The baby's womb is not completely insulated against external noise or sound. As the baby grows, after 23 to 33 weeks, the baby will be able to hear high-pitch sound such as even a car alarm. For instance, by playing music the baby may even response by moving around in the womb. For the unborn baby, hearing is the one sense that helps him to prepare for life after birth. While prolonged noise exposure may be linked to fetal hearing loss, its effects aren't well-known. However, if the pregnant mother is exposed to a noisy environment for a lot of time, it is suggested to stay away from such environment to be safe. V. Ravi Shankar, Chief Brand & Communication Officer said, "Considering the emotional state of the to-be-mother during pregnancy, it is important that we make them feel comfortable and not expose them to anything that can harm her or to-be-born baby. It is not easy to ignore how a to-be-born baby would feel with loud noise. Social messaging focussed on them, we believe, could create some impact in minds of people." Court orders and appeals from many voluntary organizations & NGOs are doing their best to reduce air & noise pollution for the benefit of public in general. LifeCell believes that taking an emotive route focussing on the safety and wellbeing of pregnant women and unborn baby could at some level make people consider avoiding loud & polluting fireworks. Mayur Abhaya, Managing Director, LifeCell said, "Our company's core being care for the mother & baby, we feel it is our responsibility to ensure their care & safety even beyond our business. While Diwali is a festive season for all we need to keep it safe for women and children most importantly the pregnant women and her baby and hence this initiative at a small level." LifeCell, established in 2004, is India's leading provider of preventive healthcare services for mother and baby wellness and healthcare solutions such as stem cell banking and diagnostic services. With facilities at Chennai and Gurgaon and a network spanning over 200 cities in India and abroad, over 3,50,000 lakh parents have trusted LifeCell for its services. LifeCell's umbilical cord stem cell banking, a community-based approach towards stem cell access, is a global first initiative that aims to provide families in India better future access to stem cells than even currently possible in advanced countries such as the US. As a comprehensive provider of preventive and diagnostic healthcare services, LifeCell presents a complete panel of pre and post-natal diagnostic tests including maternal infectious diseases test, prenatal screening and newborn screening. Through these services, LifeCell, aims to provide complete wellness for the mother and baby ensuring healthy pregnancy and healthy new-borns.